There are a number of great sites created by dissatisfied refractive surgery patients. If you are considering LASIK or another form of refractive surgery, we recommend you examine these sites closely. Doctors who buy half-million dollar lasers have very little personal motivation to tell the whole story about complications. Read the warnings of patients with '20/20 hindsight'. Follow the clues to a clearer understanding of the refractive surgery money machine. Look beyond the smokescreen and hype to uncover the truth. Do your homework before undergoing an irreversible surgery on your only pair of eyes! 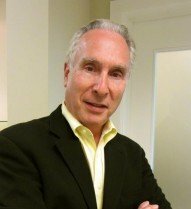 Sclerallens.com :: In the past 25 years, Dr. Boshnick has participated in over 100 clinical contact lens studies for major contact lens manufacturers. In addition, Dr.Boshnick has lectured and presented papers at national and international conferences. Our specialty contact lens practice is known as the Global Vision Rehabilitation Center. Dr. Boshnick and his staff have dedicated themselves to the restoration of quality vision to those patients who have suffered vision loss due to keratoconus, corneal transplant surgery, refractive eye surgeries such as LASIK, R-K surgeries, chronic dry eye, ocular trauma, auto-immune disease and corneal dystrophies such as Stevens-Johnson Syndrome and many other ocular conditions. 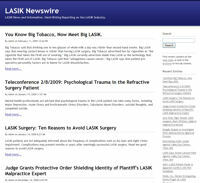 LASIKNewsWire.com :: LASIK news and information. Press releases, medical studies, special reports. Hard-hitting reporting on the LASIK industry and the medical coverups surrounding the practice of LASIK. Learn about the FDA's role in hiding the truth about LASIK risks from the public. 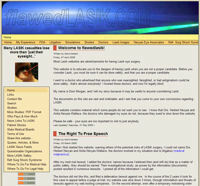 LasikScandal.com :: Providing readers with the most accurate and unbiased truth on what is currently a major health crisis, LASIK, laser eye surgery, and other forms of refractive eye surgery. Approval of Laser Vision Correction / Laser Eye Surgery (LASIK, LASEK/PRK) is a type of medical fraud -- the mission of this site is to expose it. Every eye treated by laser ablation demonstrates permanent and irreversible damage. This is unacceptable for an unnecessary, elective surgery. 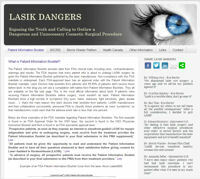 Lasik Dangers Blog :: Exposing the truth and calling to outlaw a dangerous and unnecessary cosmetic surgical procedure. Learn about Patient Information Booklets (PIB), which contain important safety information and clinical trial outcomes for each FDA-approved laser. LASIK surgeons are required to give a booklet to every prospective LASIK patient prior to undergoing LASIK. LASIK surgeons routinely fail to provide patients with these booklets because the data from the clinical trials shows high rates of complications. 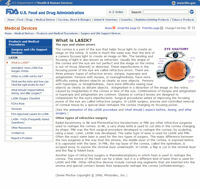 Learn how to download your booklet from the FDA website. 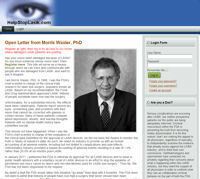 HelpStopLasik.com :: I am Morris Waxler, PhD. In 1998, I was the FDA's chief scientist in charge of the clinical trials research for laser eye surgery, popularly known as LASIK. Based on my recommendation, the Food and Drug Administration approved LASIK. In January 2011, after an independent, exhaustive review of the current data, I petitioned the FDA to withdraw its approval for all LASIK devices and to issue a LASIK public health advisory. Register on the site to Help Stop LASIK. 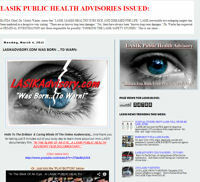 LasikAdvisory.com :: Lasik Advisory was born to warn! Blog created to warn the public about the hidden risks of LASIK, and to expose corruption surrounding the FDA-approval of LASIK. Watch "In the Blink of an Eye", a LASIK documentary and true story of how the LASIK industry deceived the FDA and covered up patient injuries for financial gain. Mike's LASIK Hell :: Mike's LASIK Hell was created to help expose the dishonest, corrupt, and dangerous LASIK industry that many patients have fallen victim to. Without websites like this and many others, potential patients would only see the false information advertised by the doctors and industry who profit from LASIK... Potential patients should be aware of the dishonest, unethical, and illegal tactics used by my doctors to dupe me into a procedure that I would not have consented to if properly informed and not lied to. 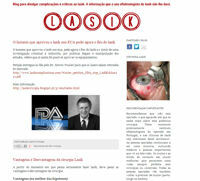 lasikcirurgia.blogspot.com :: Portuguese Lasik blog created by anti-LASIK activist to warn Portuguese-speaking prospective LASIK patients about the dangers of LASIK and the hidden complications in clinical trials. FDA's Lasik Page :: Although there is plenty of good information on the site, it falls way short of adequately warning prospective patients. Some sections almost read like an advertisement for LASIK. The "Other Resources" page contains links to LASIK surgeon organization sites, which are heavily biased. Even so, we believe that prospective patients should read it before deciding to have the surgery. 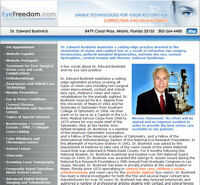 EyeFreedom.com :: Dr. Edward Boshnick maintains a cutting edge optometric practice devoted to the restoration of vision and comfort lost as a result of refractive eye surgery (LASIK, PRK, RK, etc. ), keratoconus, pellucid marginal degeneration, extreme dry eye, corneal dystrophies, corneal trauma and Stevens-Johnson Syndrome. 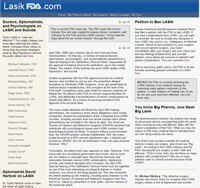 LasikFDA.com:: Exposes deceit, corruption, and collusion by the FDA and the LASIK industry. From the site: "You've read the hype about the 10-minute miracle. Now get the truth." Reports the events of the April 25, 2008 hearing of the Ophthalmic Device Panel with videos and transcripts of testimony. Shows parallels between Big Pharma and Big Tobacco and "Big LASIK". 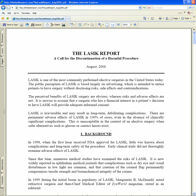 TheLasikReport.com :: A comprehensive review of the medical literature of LASIK. Examines medical studies which reveal the risks and long-term consequences of LASIK. Cites 43 peer-reviewed journal articles. The report concludes that LASIK in an inherently harmful procedure and should be abandoned. 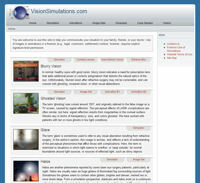 VisionSimulations.com :: Created by author and psychologist Roger D. Davis, PhD, this site features photorealistic images of the visual aberrations incuded by LASIK and other refractive surgeries, including starbursting, halos, glare, ghosting, blurry vision, and night driving scenes. Also contain numerous animations, as well as simulators that allow patients to approximate and communicate their vision to friends, family, and physicians. If you want help simulating your vision for others, start here. 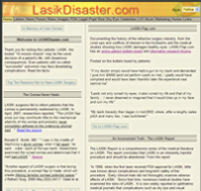 LASIKDisaster.com :: Highest search engine-ranked LASIK patient site on the internet. Exposes the LASIK industry for covering up complications and deceptive advertising. Legal resources for victims of LASIK medical malpractice. Medical research of LASIK complications and risks. News articles about LASIK complications. Images of damaged eyes. LasikMemorial.com :: Dedicated to those whose lives have been damaged or destroyed by refractive surgery, this site contains true stories written by the victims themselves. When complications occur, your life splits in two. There is the person you were before LASIK, and the person you are now... You realize that maybe human nature isn't fundamentally good, or at least that doctors aren't what you thought they were. 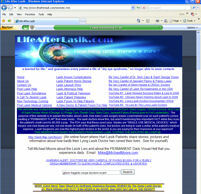 LifeAfterLASIK.com :: Created by activist, Dean Kantis. Warns about bad doctors that harm patients. Cautions prospective patients about LASIK marketing scams that sell fake certifications and entice patients into having surgery by downplaying complications. Publishes stories of patients with bad outcomes. Links to YouTube videos about LASIK horror stories. UpdegraffLasik.com :: Created by LASIK patient who experienced a life-altering bad outcome, and now doesn't feel LASIK should be advertised without disclosing contraindications, risks, and warnings. 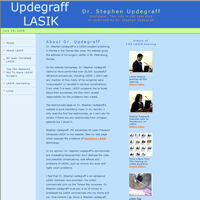 The patient built this website in protest to the heavy advertising of Stephen Updegraff, MD. The site warns about the potential complications of LASIK and the unique problems of all-laser, bladefree, IntraLase femtosecond laser LASIK. 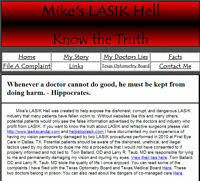 LasikFraud.com :: Created by patient activist Brent Hanson, this site states, "Are you planning to have laser eye surgery at TLC? Are you impressed with TLC's success stories? Do you believe that TLC will honor their "Lifetime Commitment" to you?... If you answered yes to any of these four questions, then please read about my experiences with eye surgery at TLC." 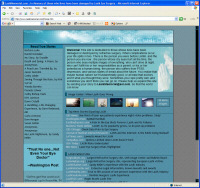 FlawedLasik.com :: Created by patient activist Dominic Morgan, this site chronicles Dominic's legal struggle with his surgeon and with the FDA. The site states, "Most Lasik websites are advertisements for having Lasik eye surgery. This website is to educate you to the dangers of having Lasik when you are not a proper candidate. Before you consider Lasik, you must be sure it can be done safely, and that you are a proper candidate. I went to a doctor who advertised that anyone who was nearsighted, farsighted, or had astigmatism could be done safely...that's almost everybody! I trusted these doctors, and now I'm legally blind. My name is Dom Morgan, and I tell my story because it may be useful to anyone considering Lasik."